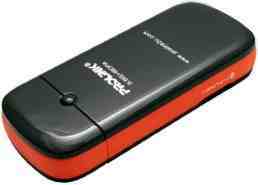 If you are a user of Prolink PHS100 3.5G HSDPA modem and also a Snow Leopard lover, than congratulation! Today, the “holy path” to make the Prolink PHS100 3.5G HSDPA modem works on Snow Leopard has been revealed. Honestly, it was just a coincidence. I’ve searched all around the net for two weeks and couldn’t find anything explaining how this “dude” works on my new MacBook Pro. 2. Install all drivers and applications from the modem itself. You should follow an step-by-step instruction written on a *.txt file inside the modem. 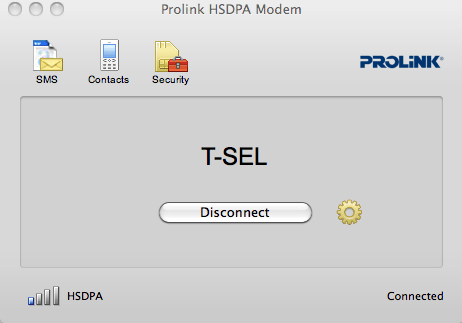 Make sure that the “Prolink HSDPA Modem.app” can be found inside your Apps folder. 3. Plug your modem in. OK, then. You shall be a little bit patient. Your Mac will detect your modem. Here is how the “miracle” happened. I found three menus on the left side of “Networks Preferences”, which were: macusb_modem, macusb_diag, and macusb_nmea. 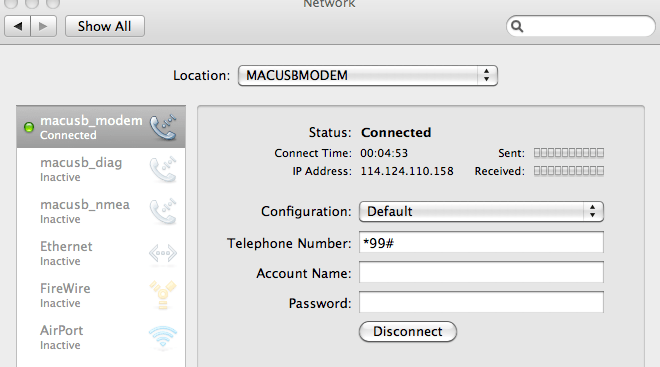 I choose “macusb_modem” and filled *99# in the “Telephone Number” form (it depends on your provider, actually.). Next, I tried to activate the “Prolink HSDPA Modem.app” from Applications folder. I pressed the “Connect” button on the “Networks Preferences” and ….. it worked! Or, you can also activate the modem by pressing “Connect” button on “Prolink HSDPA Modem.app”. To cut the connection, just press the “Disconnect” button. aq ndak bisa connect nih… ada yg perlu di isi lg ga sih?